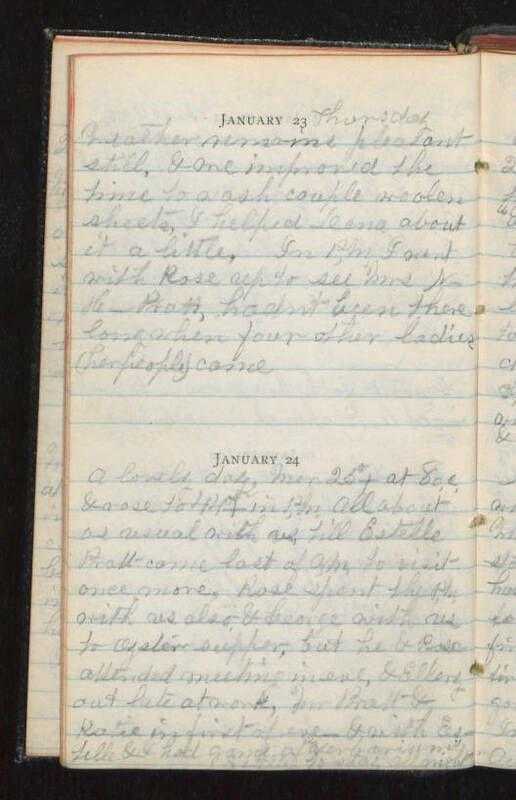 January 23 Thursday Weather remained pleasant still, & one improved the time to wash couple woolen sheets, I helped Leona about it a little. In PM I went out with Rose up to see Mrs [name? ], hadn't been there long when four other ladies (her people) came. January 24 A lovely day, Mer 23°+ at 8 o,c, & rose to 44°+in the PM. All about as usual with us till Estelle Pratt came last of AM to visit once more. Rose spent the PM with us also & George with us to after supper, but he & Rose attended meeting in eve & Ellery out late at work. Jim Pratt & Katie in first of eve & with Estelle & I had game of "verbarium" Estelle to stay all night.